I'd heard lots of good things about the new Captain Ahab Trail. Rocks, a little exposure, and flow (like a toilet hooked up to fresh pipes). 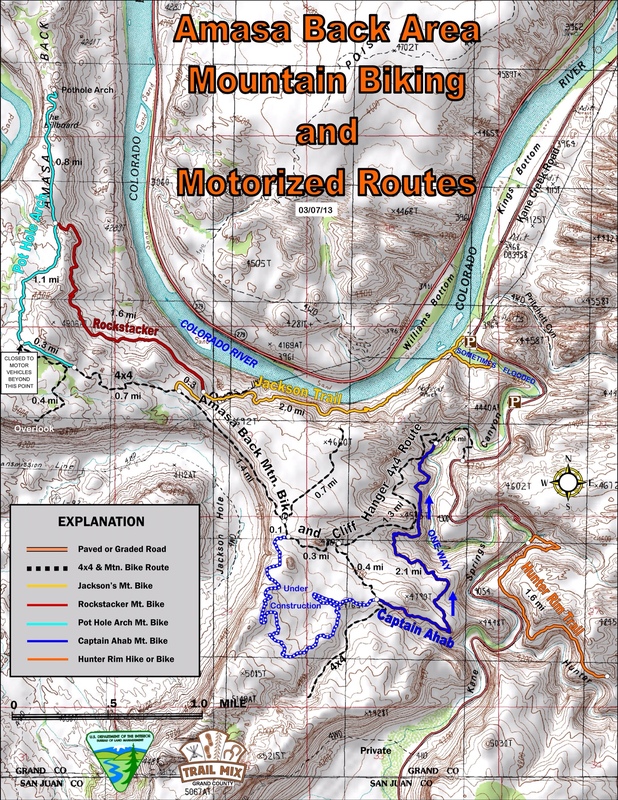 I read some stuff about the work that went into building singletrack. It all sounded like it would be awesome. 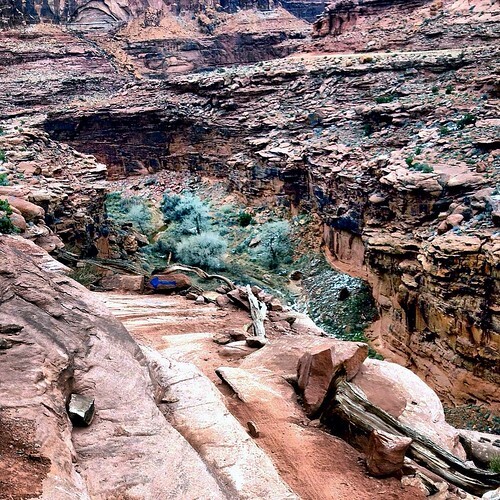 The trail kind of parallels the old Clif Hanger Trail on Amasa Back. 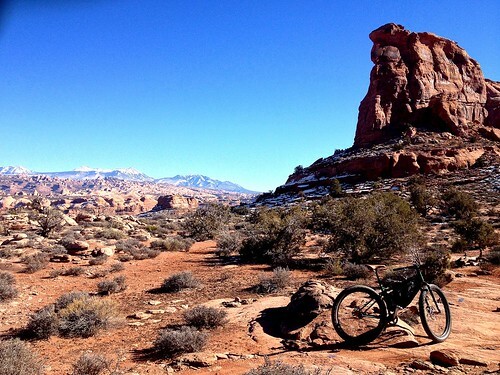 The first day we were in town, I rode almost all of the trails on that mesa- Clif Hanger, to Rock Stacker, out to Pothole Arch, then down Ahab. The last day, I rode up Clif Hanger and rode Ahab a second time. The trail was built for bikes, and it shows. 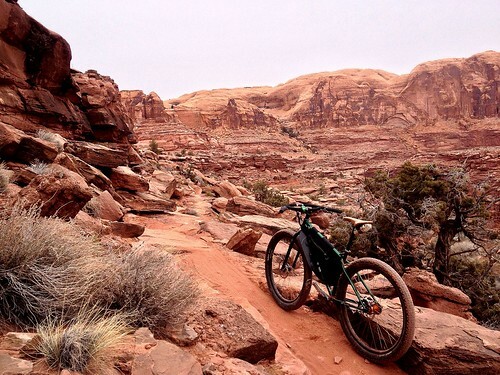 The old motorized routes in Moab are sweet, but they aren't the best singletrack rides. They're wide, usually lack fun corners, and when they go up, they go straight up. Because in a 4×4 you've gotta point it straight on, hit the gas, try to make the top before the tires break traction, and hope your cooler of beers doesn't spill out the back. Yeahaw. Fore whillin. On a bike, switchbacks are nice. Ahab has a bunch. Ahab starts with some twisty single track, mixed with fast sections of dirt. The blue paint on the route is all fresh and easy to follow. Down the first big sandstone roller, picking up speed, around a rock corner covered in little marbly dirt balls. My low-knob tires drift on both wheels, they really are terrible at hooking up on dusty crust. Twist up and up a bunch of switchbacks, square the bike at the top of a steep chute, let go of the brakes. G-out at the bottom, pop over some slickrock kickers. These lines really are dead on, and they fixed the spots where the natural terrain wouldn't work- down another roller where a huge slab has been leveraged into place. And into a steeper chute, drag the back tire on the kitty litter covered rock to slow into the next corner, past a sign that marks the start of the descent to the river. Wide open dirt, then the singletrack heads out to the rim. A few feet of trail to ride, a few hundred straight to the bottom of the canyon. Just stay on the line. “Caution! Walk your bike!” yells a sign. I slow way down and carefully roll the rock steps. Ride toward the edge and look over- about a 600 foot drop with no stops. A loose piece of gnarled wood acts like a guardrail, and is about as safe as a helmet made out of ballon animals. Along the canyon rim, down more rollers, and back onto Cliff Hanger. If I were more outgoing, or a rowdy rowdy rowdy rowdy (is anybody else sick of seeing that stupid goddamned word? I feel like I'm getting smacked with a flat-brimmed cap every time I read it) bro-brah, I would yell something excited. So excellent. That trail is everything a trail should be- it works with the natural terrain as much as possible, and fills in a few spots to keep everything together. Really great.